Younger brother of Philip [1628-1693] and son of Wolfgang [1581-1662], and another member of the renowned Augsburg dynasty of engravers and artists. He completed an apprenticeship with his father, showing early and remarkable talent. In 1645 he engraved a title vignette of a Kneeling Virgin (Hollstein, no. 721) for the Munich brotherhood of the Virgin, and a drawing (Augsburg, Staats- & Stadtbib.) for a bust portrait of an unknown man, done in 1646, displays his ‘great capacity’ and ‘strength’ (Georg Christoph Kilian). This early capability is further demonstrated by the large signed drawing Cherubim (1646; Munich, Staatl. Graph. Samml. ), in charcoal heightened with white. In 1648 his father sent him to Matthäus Merian I in Frankfurt am Main, with whom he remained for two and a half years where he produced his first major portraits engraved after Old Masters. 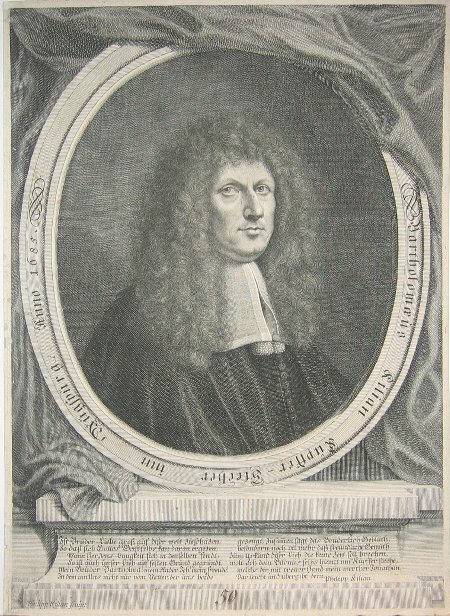 He then spent the subsequent three years in Paris with the engraver François de Poilly, from whom he learnt the ‘flowing technique of French portrait engraving’ (Hämmerle). While in Paris he studied and reproduced the work of a number of the French court painters. His largest portrait of Kaiser Joseph of Austria on horseback (Vienna 1694) comprised 8 separate copperplates. It is not known whether he engraved any maps, as his father Wolfgang had done.